The Doe v. Bolton decision by the US Supreme Court was issued on the same day as the more well-known Roe v Wade and although Roe authorized abortion beyond the point of fetal viability to protect the “life or health” of the mother, Doe provided such a broad definition of “health” that it effectively required that abortion be legal through a pregnancy’s entirety. The anonymous plaintiff “Mary Doe” has since been identified as Sandra Cano, a 22-year-old mother of three who was nine weeks pregnant at the time the lawsuit was filed. Cano, who died in 2014, described herself as pro-life and claimed her attorney, Margie Pitts Hames, lied to her in order to have a plaintiff. She, and Jane Roe alike, did not have an abortion but chose adoption for her little girl. 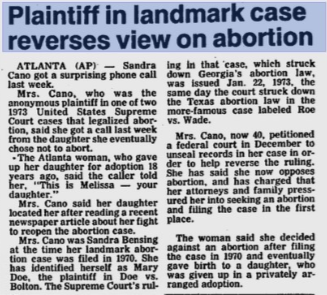 In 2003, Sandra Cano, filed a motion to re-open the case claiming that she had not been aware that the case had been filed on her behalf and that if she had known she would not have supported the litigation. The district court, appeals court and the US Supreme Court denied her motion.